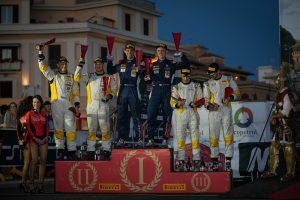 Filip Mareš won a closely-fought battle in FIA ERC Junior Under 27 with the ACCR Czech Team driver climbing from his overnight third place to first in his Pirelli-shod Peugeot 208 after demoting Opel drivers Jari Huttunen and Chris Ingram with a sublime run through Sunday’s opening stage to bag a lead he wouldn’t relinquish. Mareš put his early morning pace on Rally di Roma Capitale down to his decision to use soft compound Pirelli tyres on the damp opener. Huttunen chose hard tyres and lost time, while Ingram was lacking in confidence unable to commit to his pacenotes. Earning the Colin McRae ERC Flat Out Trophy, Mareš is one of four drivers firmly in contention for the title – and the 100,000 euros career progression fund on offer to the champion – heading to the finale in Latvia, where he will start with a two-point lead over Ingram. Behind Ingram, Karel Kupec, Kristóf Klausz and an ill Tamara Molinaro completed the top six. Domink Brož retired with technical issues on stage seven where Catie Munnings lost several minutes stuck in a ditch. Munnings battled back to finish seventh with Molinaro securing the ERC Ladies’ Trophy spoils on home soil after Emma Falcón retired on the penultimate stage. Aleks Zawada arrived in Italy leading the standings but a flywheel failure on stage two forced his early exit. The Pole will work tirelessly to secure the funding needed to contest Rally Liepāja next month where he can still take the title.